Here is a link to their Radio Show, which can be found on Blog Talk Radio, they are broadcasting live, every day. They have shorter shows some days. 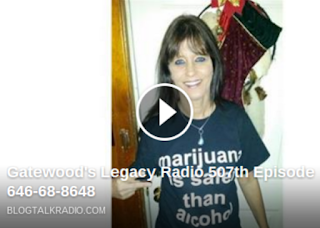 The host and co-host of the Gatewood Legacy Radio show both have Safer Shirts thanks to The owner operator of Choice Wellness Center in Seattle, Washington, Dawn Darington. 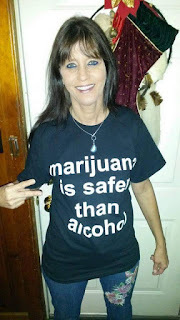 Dawn Darington gave me a job (as a medical cannabis consultant) a while back, and I have to say it feels good to come in to work and see the boss wearing a t-shirt that I invented almost every day. It is extra awesome to hear that Dawn is mailing Safer Shirts to activists in other parts of the world! Rebecca Collins is in Kentucky and her co-host Jolene Kendall is in Utah, but they meet up on the web in the virtual radio world and collaborate to make a great show together even though they're states away! Thank you Rebecca Collins for creating a great online radio show, and thank you for letting me be a part of it! 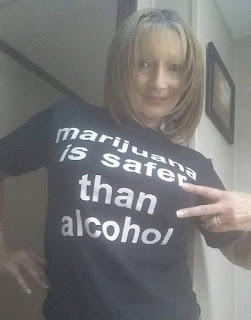 Thank you Jolene Kendall for creating a great online radio show, and thank you for wearing your Safer Shirt!